Ooops. Remember Wednesday when we dropped word on the blogs that the Onyx had been tagged the 9020 and that we had also heard the trackball would be staying on the final version?? Well we've got good news - it turns out that in regards to the trackball, that's not the case!!! Upon further digging, and double confirming with some trusty peeps who have now actually seen it, there are already now Onyx's in existence that in fact have the optical trackpad (currently featured in the Curve 8520 - pictured above on right). The new and improved word is that the Onyx's buttons have received a slight redesign to accomodate the inclusion of the trackpad and that the 9020 will go to market with it. Awesome. This all jives well with previous word (dating back to May) that the Onyx/Driftwood would definitely be getting it (even though pre-release devices were sporting trackballs). 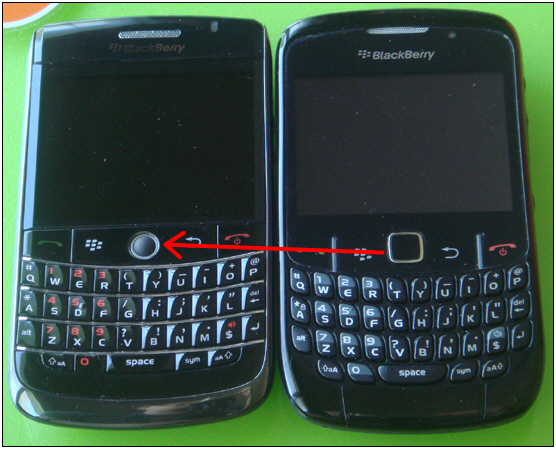 As for why the Onyx didn't have the trackpad in place from the get-go, I think part of the reason has to do with the fact the Curve 85xx was designed by RIM's Florida team (tasked with reducing costs/replacement), while the onyx was/is being developed by RIM's German design team, obviously somewhat in parallel. Though the trackpad isn't a 'perfect' solution (check out this forum post of where it has let me down just once in over six weeks of use), as I've gushed many times in the blogs already I'm absolutely in love with it. Now I'm truly excited for the Onyx. I can't wait to see photos of the updated device. The only bad news here is for the those who have pre-release Onyx's... it's hard to say (I'm guessing it's doubtful??) that future firmware upgrades will continue to support the trackball with the trackpad now going in place. Ah well.. them is the breaks. Bring on the trackpad!